The lady had a retained deciduous eye tooth because the permanent canine stuck in the jaw bone and never came through. The baby tooth was now getting loose and about to cause a big cosmetic problem! 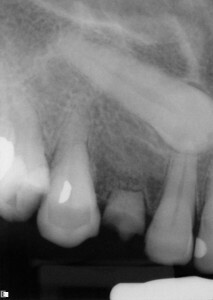 The tooth was removed, and the neighbouring teeth prepared for a bridge, with the patient under IV midazolam sedation. Guess why an implant wasn’t a good idea? The teeth were unusually small, and there was very little physical clearance for bridge construction. So instead of the conventional porcelain-fused-to-gold material, which would have looked ugly in this case, we went for the new generation super-strong porcelain zirconium. 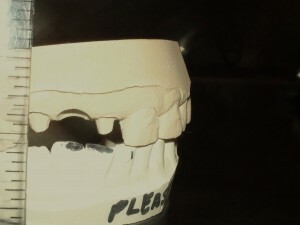 Occlusal view. Look: no metal! A beautiful, natural and extremely strong material. 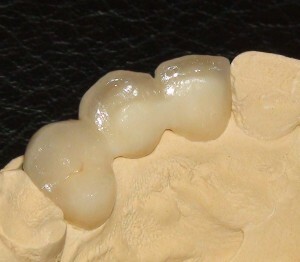 With all porcelain bridges, we don’t see a black join line at the gum line which is common with PFM bridges. A natural smile…a great result!